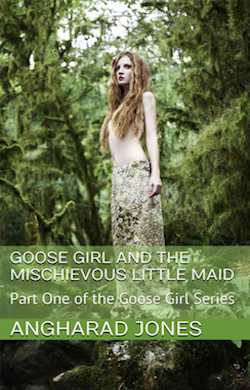 In part one of Goose Girl and the Mischievous Little Maid, you will encounter a fractured fairy-tale that goes behind the scenes of the classic Grimm Brothers’ fairy-tale. Of all the fairy tales of the Brothers Grimm, this story is the shortest. In the original fairy tale, the princess is enroute to a distant castle to meet the prince whom she is to marry. Along the way, the guards die (don’t remember why) and the maid, through sheer force of will, overcomes the princess and makes her change clothes with her and adopt the persona of the maid, while the maid adopts the persona of the princess. When the maid–dressed as the princess, and the princess–dressed as the maid, arrive at the castle, the maid takes off with the prince and disappears. Who knows what they’re getting up to. Mischief, no doubt. And the princess is sent off to tend to the geese. Now, in most stories of the Brothers Grimm, Kings tend to be rather stupid creatures, but in this particular story, the King is smart. He happens to notice the ‘goose girl’ and he is surprised to see how graceful and elegant she is. The implication being, of course, that only princesses can be elegant, ethereal creatures, while maids are slatternly and sloppy. During the wedding banquet, the King poses a question to the ‘princess’ as she sits beside the prince. He asks her what she would do if someone were discovered to be found out to be a fraud? Hmmm, really? That’s your answer, huh? What in the world was this foolish girl doing? Well, as you may already know, and is so true with the fairy tales of the Brothers Grimm, the foolish mortal who shows venality, greed, stupidity, arrogance, and who is otherwise behaving badly, always meets a bad end. The moment the words have left the false princess’s lips, she is revealed to be a fraud! The King has the rightful princess restored to her place beside the prince, who must be the biggest dolt in the world, but then again what does he care? He gets to bed another girl! And the false princess, the maid, is sent to the executioner and her head lopped off. The moral of the story, of course, is this: women, do not run for president of the United States, as you shall be put in your place. Do not put yourselves above others. Do not engage in blind ambition or career-ladder climbing, because there will always be a man somewhere who will expose you for the fraud you are and hand you your head! A cautionary tale for women. Only I got to wondering . . . what possessed the little maid to take control over the princess? Had she been the princess’s personal maid from the cradle? Were they the same age? Did the little maid resent the princess? The Brothers Grimm, who usually wrote long stories filled with past histories of the characters, devoted very little ink to this story, and it takes up only two pages of text. What, I wondered, was the little maid’s motivation to do what she did? And that’s when I started writing my version of the Goose Girl story. I hope you enjoy this story, for it has been one of my favorite stories to write.